And Halloween is a good time for them to rise. Last year I found a fabulous non-fiction book on bones to add to our Halloween fun. Bones are alive. They grow as an animal grows, get stronger when they are strained, and repair themselves if they get broken. Bones come in all shapes and sizes ... Jenkins shows the comparison and differences between animal and human bones with many of them depicted to scale. Beginning with the hand and comparing it to that of a chimp, Jenkins moves ... [to] comparisons of feet, femur, ribs, spine and skull from those of a human to various animials. Joints, symmetry and adaptations for survival are touched upon. 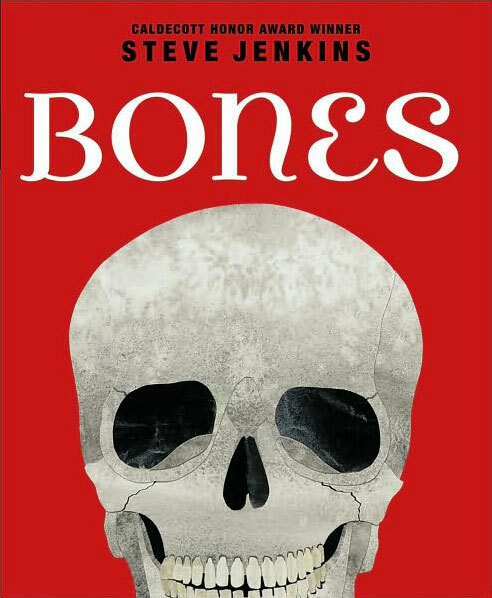 Bones is a visual delight; the text is secondary to the illustrations. The cover intrigues the reader with a life size cut paper collage of a human skull. The illustrations, in whites, greys and muted yellows stand out against solid colour backgrounds. The book also tickles a sense of wonder. The heavy femur of an elephant is juxtaposed with that of a human and a cat, and is placed next to the illustration of a stork skeleton. A gatefold page shows the skeleton of a "small" python, with almost 200 ribs. Humour also keeps the reader intrigued. 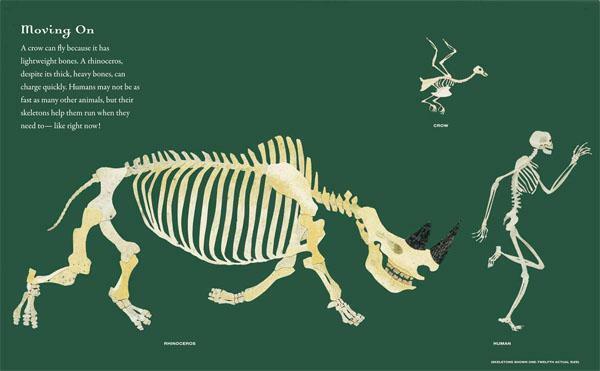 A rhinoceros skeleton is chasing a human skeleton on the page about movement. 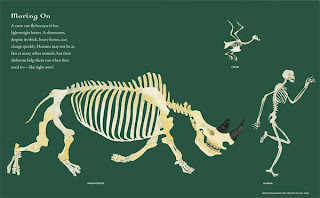 All 206 bones of the human body are neatly placed in groups, with the message "some assembly required" on the page before a gatefold pages with all the bones in their correct homes. It is a book that can be pored over, read and reread, as well as a book that can hold the attention of a kindergarten class of 5 year olds for over 15 minutes. The University of Texas in Austin has a website with photos and information about animals and their skeletons. 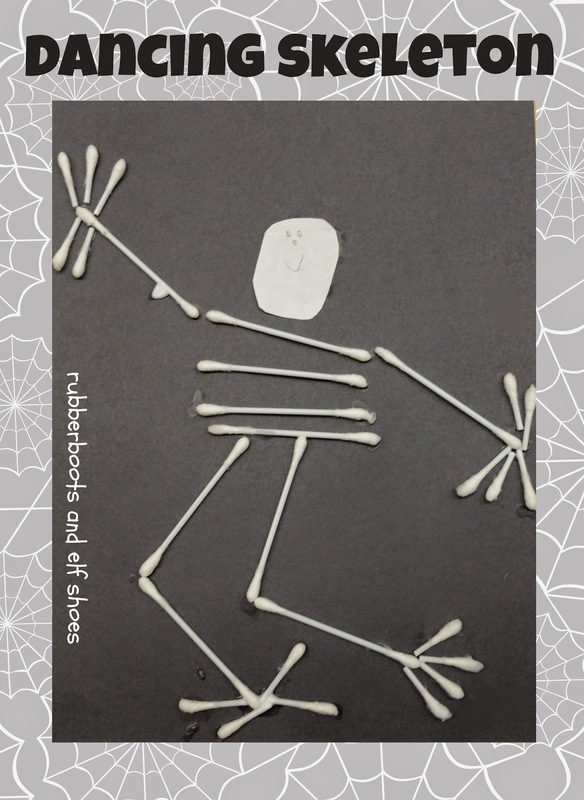 Under "resources" you can click on teaching activities and find a link to print out life size skeletons. MEDtropolis is the home of the virtual skeleton. There is a guided tour of the human skeleton, the ability to zoom in for a closer look and you can assemble a skeleton. It won't get you through med school, but it is pretty fascinating. Science Kids has a page with online games and activities about skeletons and bones. A Q-tip skeleton. This has been a little buddy - big buddy project for the last few years - each skeleton has its own personality even without all 206 bones. A paper chain skeleton - when there is air movement in the room, they "dance". Bones is a perfect picture book for Halloween. A huge thank you to Susanna Hill for hosting Perfect Picture Book Friday: your one stop shop for fabulous picture books for any and all occasions. I just pinned the book and art. It all looks so cool. I love the video, too. I'm going to show it to my kids next week. Great pick! I like the cover! Bones are VERY important to us! ;) I love the paper chain skeleton activity! This is a great, nonfiction Halloween pick. We've been singing the "skeleton dance" all week, so I think this one would be a big hit. Jenkins is a favorite. Great review. I like the visual sample you posted. Thanks. Aha, love your bone activity. This is a great book for older kids -- need more of these informative books. Kids are interested in their bodies.